Comes Up Smiling ; 1915—last stage appearance in The Show Shop ; 3-year contract with D. W. Griffith's Triangle Film Corporation; film debut in The Lamb ; 1916—first screen success in His Picture in the Papers ; 1917—formed Douglas Fairbanks Pictures Corp., releasing through Artcraft, a subsidiary of Famous Players-Lasky (later Paramount); 1919—with Mary Pickford, Charles Chaplin, and D. W. Griffith, formed United Artists distribution company; 1927—first president of the Academy of Motion Picture Arts and Sciences; 1929—first sound film, The Taming of the Shrew , opposite Mary Pickford; 1936—announced retirement from acting; 1938—formed Fairbanks International production company. Died: 12 December 1939. Laugh and Live , New York, 1917. Making Life Worth While , New York, 1918. My Secret Success , Los Angeles, 1922. Youth Points the Way , New York, 1924. "Combining Play with Work," in American (New York), July 1917. "The Development of the Screen," in Moving Picture World (New York), 21 July 1917. "Roping Doug Fairbanks into an Interview," by Frederick Smith in Motion Picture Classic (Brooklyn), September 1917. "A Photo Interview with Douglas Fairbanks," by Alfred Cohn in Photoplay (New York), October 1917. "Douglas Fairbanks' Own Page," in Photoplay (New York), November 1917-April 1918. "Why Big Pictures?" in Ladies Home Journal (New York), April 1924; also May and September issues. "The Magic Carpet of My Life as Told to Stuart Jackson," in Pictures and Picturegoer , 18 March 1933–1 April 1933. Florey, Robert, Douglas Fairbanks , Paris, 1926. Talmey, Allene, Doug and Mary, and Others , New York, 1927. Leloir, Maurice, Cinq Mois à Hollywood avec Douglas Fairbanks , Paris, 1929. Cooke, Alistair, Douglas Fairbanks: The Making of a Screen Character , New York, 1940. Hancock, Ralph, and Letitia Fairbanks, Douglas Fairbanks—The Fourth Musketeer , New York, 1953. Eisenschitz, Bernard, Douglas Fairbanks , Paris, 1969. Carrol, David, The Matinee Idols , New York, 1972. Schickel, Richard, His Picture in the Papers , New York, 1973. Thomas, Tony, Cads and Cavaliers—The Film Adventurers , New York, 1973. Fairbanks, Douglas, Jr., The Fairbanks Album , introduction and narrative by Richard Schickel, Boston, 1975. Carey, Gary, Doug and Mary: A Biography of Douglas Fairbanks and Mary Pickford , New York, 1977. Tibbetts, John, and James Welsh, His Majesty the American: The Cinema of Douglas Fairbanks, Sr. , New Brunswick, N.J., 1977. Herndon, B., Mary Pickford and Douglas Fairbanks: The Most Popular Couple the World Has Ever Known , New York, 1977. Richards, Jeffrey, Swordsmen of the Screen: From Douglas Fairbanks to Michael York , London, 1977. Ford, Charles, Douglas Fairbanks ou La Nostalgie de Hollywood , Paris, 1980. Fairbanks, Douglas, Jr., The Salad Days , New York, 1988. Hornblow, Arthur, Jr., "Douglas Fairbanks, Dramatic Dynamo," in Motion Picture Classic (Brooklyn), March 1917. Zeidman, Bennie, "Trailing Dynamic Douglas Fairbanks," in Photoplay (New York), May 1917. Naylor, Hazel, "The Fairbanks Scale of Americanism," in Motion Picture Magazine , February 1919. Bates, Billy, "The Pickford-Fairbanks Wooing," in Photoplay (New York), June 1920. St. Johns, Adela Rogers, "The Married Life of Doug and Mary," in Photoplay (New York), February 1927. Mercer, Janet, "The Fairbanks' Social War Is On," in Photoplay (New York), August 1936. Behlmer, Rudy, "Swordplay on the Screen," in Films in Review (New York), June-July 1965. Beresford, Bruce, "Swashbuckling Movies," in Granta , 3 May 1967. Bodeen, DeWitt, "Douglas Fairbanks," in Focus on Film (London), Winter 1970. Gow, G., "Doug," in Films and Filming (London), May 1973. Schickel, Richard, "Douglas Fairbanks" in The Movie Star , edited by Elisabeth Weis, New York, 1981. Carbonnier, A., "Douglas Fairbanks," in Cinéma (Paris), January 1982. Podheiser, J., "Pep on the Range, or Douglas Fairbanks and the World War 1 era Western," in Journal of Popular Film (Washington, D.C.), Fall 1983. Oakes, Philip, "That Fairbanks," in Listener (London), 26 January 1984. Schickel, Richard, "Mary Pickford and Douglas Fairbanks, Sr.: The Fabled House of Hollywood's Fabled Couple," in Architectural Digest (Los Angeles), April 1990. Katchmer, George, "Remembering the Great Silents," in Classic Images (Muscatine), October 1995. Herpe, Noël, "Festival Fairbanks," in Positif (Paris), May 1995. Tibbetts, John C., "The Choreography of Hope: The Films of Douglas Fairbanks Sr.," in Film Comment (New York), May-June 1996. Uffelen, René van, "Selfmade Swashbuckler: Retrospectief Dougalas Fairbanks," in Skrien (Amsterdam), December-January 1998–1999. Birth of a Legend , produced and directed by Matty Kemp, released 1966 to accompany widescreen, rerecorded, and rescored version of The Taming of the Shrew . The significance of Douglas Fairbanks is linked to the development of early screen comedy and the later development of the star system in the American film industry. His early career parallels Chaplin's—both began as silent comedians at approximately the same time and both succeeded in developing popular and distinctive screen personas. In 1919 they were both celebrities with sufficient autonomy to enter into a partnership with Mary Pickford and D. W. Griffith to form the United Artists Association, a very important precedent for movie stars, since its adjunct operation, the United Artists Corporation, was to give them control over the distribution of their films. No longer would stars of their rank necessarily be salaried employees. 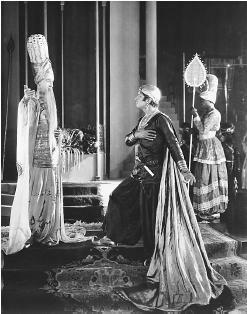 Of the "artists" involved, only Fairbanks was not bound by a long-term contract, and he was the first to complete films distributed by the new corporation, His Majesty, the American and When the Clouds Roll By , both in 1919. The following year would see a major shift in his style and his image, guaranteeing him continued popular success for the following decade. Fairbanks had held a conventional desk job for a while before turning to Broadway and a serious theatrical career. By 1914 he was a popular success and under contract to make films for the Triangle Film Corporation, which offered him $2,000 per week for his services. By 1916 he had become one of Triangle's top stars at double his original salary, after having made 13 films in 18 months. When Triangle balked at his demand for a $15,000 weekly salary, Fairbanks offered to form his own corporation that would produce eight features yearly to be purchased for $200,000 each. By March of 1917 the Douglas Fairbanks Pictures Corporation, centered in New York, had been set up, with the movies to be distributed by the Artcraft Corporation. The first Fairbanks screen persona emerged out of his theatrical roles: a cheerful young man of natural good humor, capable of integrating rural and urban values, often a rich idler wrenched from the city and rejuvenated through being challenged by the American wilderness. His early comedies tapped popular interests—the "social gospel" of Billy Sunday, for example, and the rugged individualism of Teddy Roosevelt. In The Mollycoddle , a picture that drew its title from a word Roosevelt had coined, the Fairbanks character is costumed to resemble Roosevelt. Both Fairbanks and Roosevelt were obsessed with physical culture and the "gospel of strenuosity." The typical Fairbanks character of this period attempts to integrate the values of the east and the American west. The great redefinition of the Fairbanks character came in 1920 with The Mark of Zorro , the first of his extremely popular costume films, but here and subsequently Fairbanks remained primarily a comedian in costume, a satirical swashbuckler inclined to laugh in the face of danger. Fairbanks managed to cover his popularity from several angles. He married Mary Pickford in 1920, making a business connection into a family tie, and the matinee idol was to reign over Hollywood with "America's Sweetheart" from the palatial estate of Pickfair for about ten years. Singly, each was tremendously popular; together they were unbeatable, the very embodiment in the popular mind of "Hollywood happiness." Fairbanks certainly knew how to attract and sustain the attention of the American public. Oddly enough, however, Fairbanks and Pickford did not star in a picture together until 1929, when their marriage was on the verge of breaking up. The picture, Shakespeare's Taming of the Shrew (with "additional dialogue by Sam Taylor"), was itself strangely ironic, with Fairbanks as Petruchio playing against Pickford's Kate. By this time, however, Fairbanks had already peaked. No picture made after The Taming of the Shrew would match the artistry or popularity of his great costume films— The Black Pirate , The Thief of Bagdad , Robin Hood , or The Three Musketeers , though some very interesting work was also done towards the latter end of the decade in The Gaucho and The Iron Mask . None of the post-Pickford films— Reaching for the Moon , Around the World in 80 Minutes , Mr. Robinson Crusoe , or The Private Life of Don Juan —worked well for him. After his divorce from Pickford in 1936 (they had separated, finally, in 1933), and his third marriage to Lady Sylvia Ashley, his film career was in fact over, but he had managed to sustain a youthful and energetic image far longer than most men could have done.